Aug. 14, 2017, © Leeham Co.: It’s not a done deal yet—the business for the so-called Boeing 797 remains a challenge. But the consensus is that Boeing will launch the program next year, for an entry-into-service around 2025. Boeing 797 concept. Source: Boeing. Yet there are airlines that say they don’t want to wait that long for a new airplane. Acquire the Airbus A330-200. It’s available now. Fuel is cheap and is expected to remain so well into the next decade. Acquire the A330-800. It’s fairly cheap. It’s about 10% less expensive to operate on a per-trip basis than the A330-200. The new engines will serve as a hedge against rising fuel prices for an indefinite future. There’s another option that is not readily apparent. 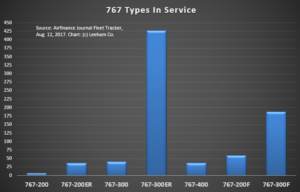 With an expected launch of the 797 New Midrange Aircraft program launch next year, serving the Middle of the Market sector, the development gap between launch and entry-into-service is about seven years, depending on the engine makers. Although Boeing’s public position about EIS remains constant at 2024-2025, LNC has heard 2025-2026 also discussed because of the uncertainty over just when a new engine will be ready. All three engine makers are studying the demand and solutions: CFM/GE, Pratt & Whitney and Rolls-Royce. CFM/GE and PW look at engines in the 45,000 lb thrust range that rely on engine technology from today’s CFM LEAP and PW GTF engines, and from GE’s GE9X program. RR is developing its own engine with new technology. There remains a wide range of issues to sort out by the engine makers and Boeing before the 797 is launched. LNC has discussed these previously. A question facing Boeing is what to do for its customers between now and a 797 EIS. The problem is more acute for Boeing than it is for Airbus. The latter offers the A321neo and A321LR. It’s studying a further improvement, called the A321neo+ (as well as an A321neo++, a less-likely option) that would add even more range and make the plane a more reliable non-stop option in winter wind conditions across the Atlantic. LNC examined how Airbus might further improve the A321neo here and here. Airbus also claims that at the upper end of the MOM sector, the A330-200 and A330-800 cover the market. These aircraft may provide an interim solution, but few believe they are long-term answers. 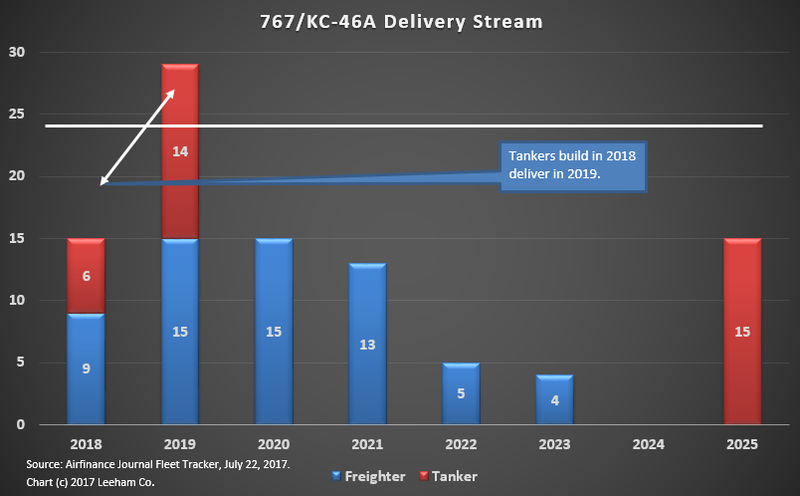 LNC’s own analysis concludes that they are not economically competitive to the larger, 270-seat 797-7 as we believe the airplane will emerge. Boeing’s new 737-MAX 10 is not a MOM sector answer. With a range of only 3,200nm, it’s not an effective trans-Atlantic airplane. It will work fine in US domestic, Europe-Africa and intra-Asian service (with some field restrictions like the 737-9). Boeing doesn’t want to build the 787-8 due to its lack of production commonality with the 787-9/10 and it, like the A330s, has far too much range for the MOM sector requirements. Boeing has an interim solution to tide it over to the 797 EIS. It’s called the 767. This is not as crazy as it sounds. The 787, of course, was designed to replace the 767 and it largely has done so. The last 767-300ER-passenger model was delivered in 2014, and only a few were delivered the year before. Here’s why the 767 can be an interim solution for Boeing. It’s available. FedEx and the USAF fill production for the next two, maybe three years but after that, there are open slots. Furthermore, it’s always possible (though we consider it unlikely) that the production rate could be increased. The A330s also are available but the 787-8 is not. 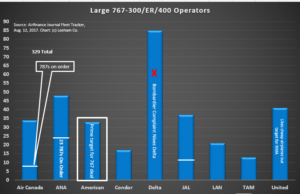 Boeing successfully sold end-of-line 777-300ERs for $120m-$140m, depending on the customer, says market intelligence, creating a precedent for a similar strategy for the 767. Even the 767-200ER passenger model could potentially be restarted. The USAF KC-46A is based on the -200ER, so there’s no special issue with this option. The 767s have lower or nearly equal trip costs to the A330-800 (they are lighter aircraft) but higher seat mile costs to the A330’s larger capacity. Direct operation costs, which include the purchase or lease rate costs, depend on the deals Airbus and Boeing would offer to the buyer. 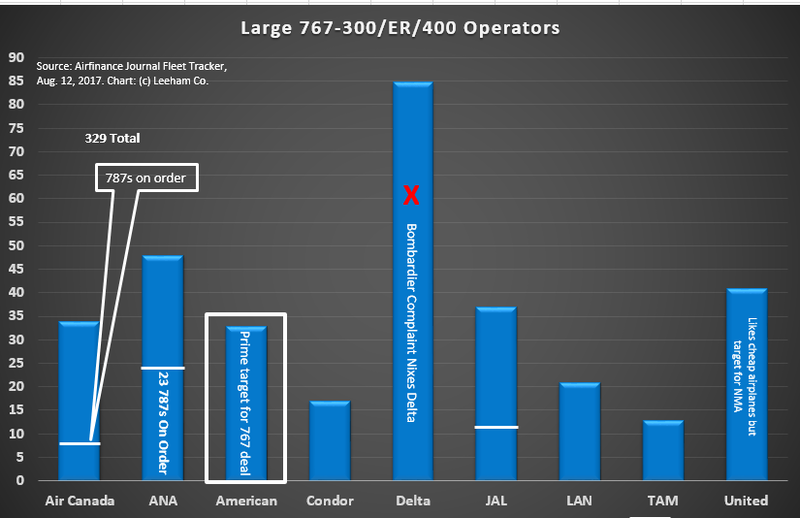 There are a few 767 operators that don’t have an equal number of outstanding 787 orders. Of course, these customers will be key targets for the 797. 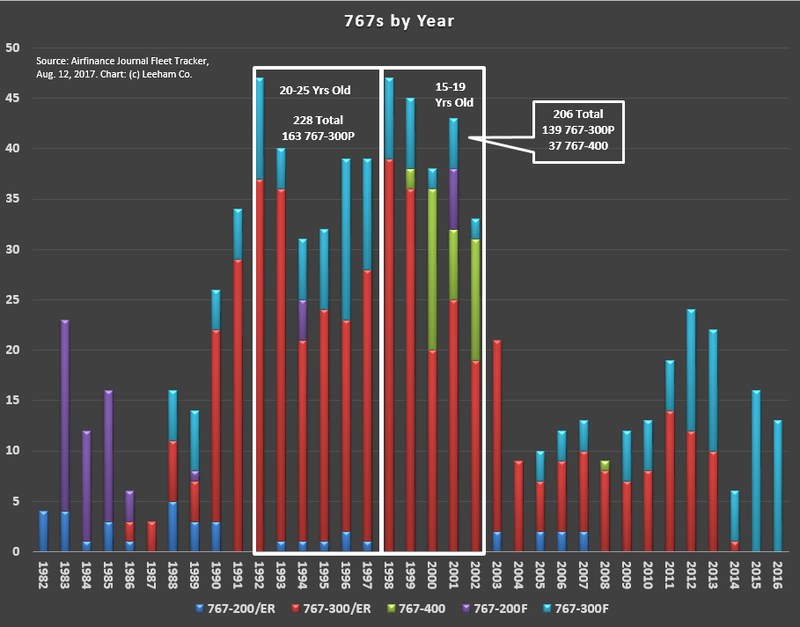 But with an EIS of ~2025 and the typically small, progressive ramp-up, these airlines face aging 767 fleets. The Airbus “solution” of the A321neo/LR/neo+ and A330s requires a new fleet type integration in some cases, a dubious prospect when the 797 is over the horizon and a replacement for the Airbus and Boeing single-aisle replacements may not be far behind. The opportunities are limited, to be sure, just as selling cheap, end-of-line 777s has been highly limited. American Airlines is one such opportunity. Officials publicly said they “can’t” wait until 2025 for the 797; they need to replace aging 767s and Boeing 757s starting around 2020. With a large order for A321neos, most of the 757s are taken care of. But AA officials also said the A321LR is too small and slightly short on range to replace international 757s. An A321neo+ could address the range issue, but capacity remains a problem without developing the A321neo++, with 12 more seats. Even this may not be enough for American. On the other hand, Boeing can offer American the 767-300ER that’s fully compatible with the existing fleet. A lease structure to allow American to return the airplane to Boeing after 10 or 15 years could easily be created, protecting AA against fuel price hikes and providing a transition to a 797. United Airlines already demonstrated it likes cheap, current technology airplanes, as demonstrated with its acquisition of 777-300ERs and the 737-10. UAL, like American, could be a prime target for an interim 767deal. 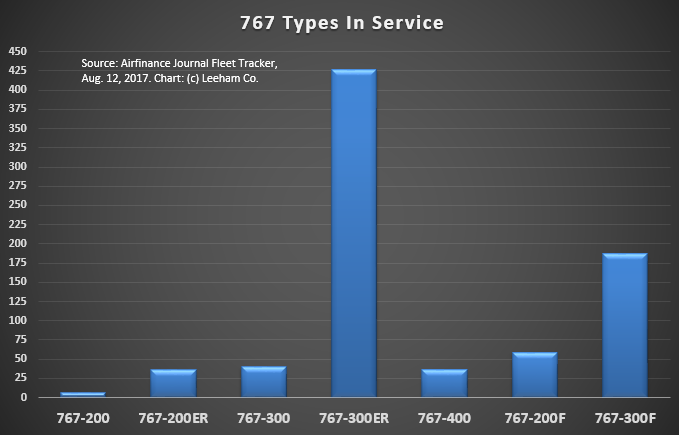 Japan Air Lines is another carrier that has a mismatch of 787 (-9s) orders to 767s in service. One carrier with a large fleet of 767s that Boeing can write off is Delta Air Lines. With the complaint Boeing filed against Bombardier alleging price dumping for its CS100 deal with Delta, the airline is widely viewed as lost to Boeing for the foreseeable future. Even if Boeing sells only three or four dozen 767s under this scenario, it serves a tactical purpose to limit sales by Airbus for the A321neo or A330s. On the strategic front, if 767 deals become tied to the potential launch of the 797, Boeing wins key customers to launch the NMA. It’s a smart move, if Boeing goes down this path—and succeeds. Do you guys have roughly an idea of the selling price of the B797? The customers want it in the $70m-$80m range. Part of Boeing’s business case problem is figuring out how to cost the airplane low enough to sell it at this price. @AirD: Boeing isn’t stating–it remains coy. But based on our market intelligence, it’s a twin aisle 2x3x2 elliptical composite airplane. Thanks Scott for your feedback. Do you have an idea how many firm orders Boeing would need to launch a such program? @AirD: Too early to guess. It was said in the article that Boeing does not want to build the 787-8 because of no commonality with the -9 and -10. How different is the -8 compared to its big brothers? This Maybe an opportunity to do a 787-8MAX in 5+ years time, 🙂 discontinuing it will leave a gap in the 787 family.